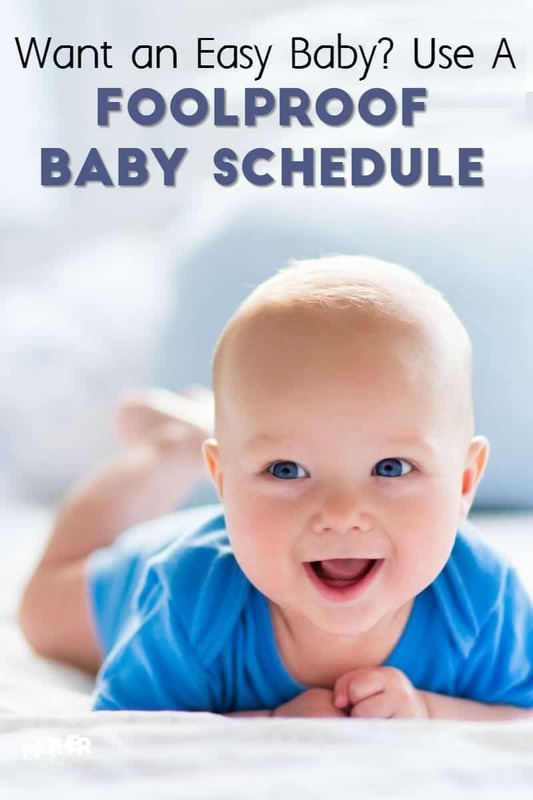 In this post you will find information on creating a baby schedule for baby aged newborn to 1 year. You can view all my sample schedules here and learn about sleep training here. I moved countries when I was 18 weeks pregnant. From England to Scotland. Oh, I’m American, by the way. 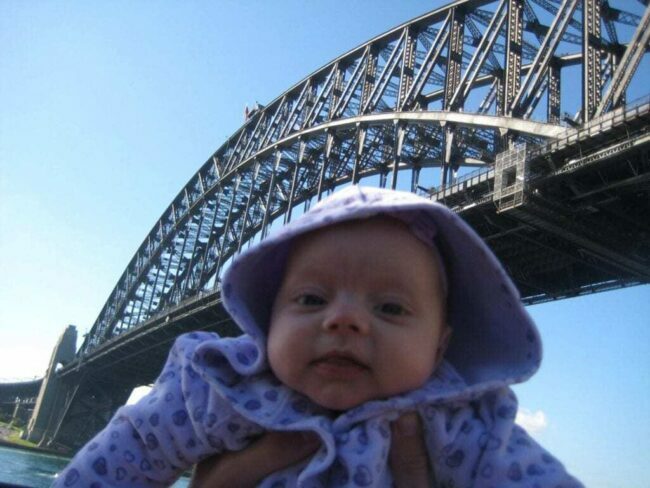 Then, with a 6 week old baby I moved from Scotland, via Florida, to Sydney, Australia. Let’s just say… it was all a bit crazy. I craved normalcy. I was in a new place with new people. We were trying to find somewhere to live, jobs, all the while settling in to becoming parents. We were *this close* to nervous breakdowns every day for weeks and do you know what was the only thing that kept my mind in this universe? Through the turmoil, driving around, going to and fro and flying, she was content. She was happy. She was an easy baby. Our circumstances were hard, but it was still easy to have a good routine. Why? Because she was so happy with it, we couldn’t imagine life another way. Each family is different and will have rhythms and routines that fit their particular lifestyle. The goal is not to create a cookie cutter baby schedule, but to find one that works for your family and keeps your baby happy, well fed, and content. This is not as hard as it seems. The first thing to consider is your baby’s wake time. This is the time they wake up in the morning. You can, in fact, decide more or less what time you want your baby to wake up. When they are newborns (a sample newborn routine here) you simply feed them at an early morning feed, say 5 a.m., then immediately put them back down to sleep. If you follow these swaddling tips, keep the blackout blinds drawn, the white noise on, and don’t overstimulate baby, baby will likely go back to sleep for another 1.5 hours or so. Then, you choose what time you want them to wake up. You might choose 7, for example. Around 7 o’clock on the dot (or as close as you can) you feed baby every morning. Soon your baby will get used to this time and her metabolism will simply have her sleep until 7. I have had 5 babies so believe me, it works. 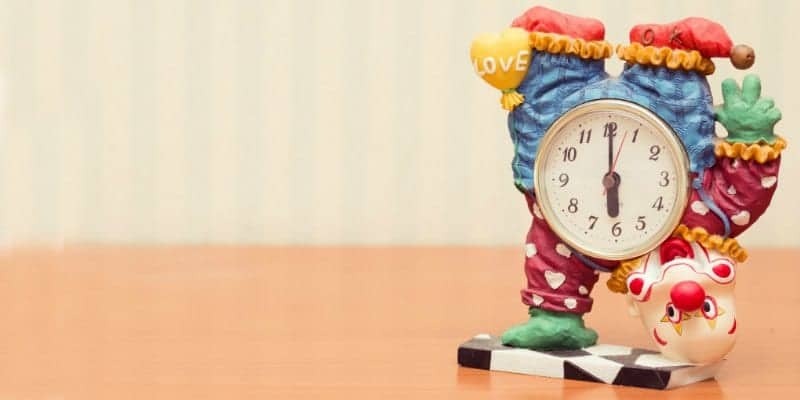 If your baby is regularly waking up at 5 am or 6 am and you want him to sleep longer, try this. Wake yourself up around 4 or 4:30 am and feed baby. Keep lights low, don’t change the diaper unless it’s very soiled, don’t unswaddle, just feed lying down so baby stays asleep. Put baby back in the crib or place it normally sleeps and then feed at your normal “desired” wake up time. If baby wakes up at 6:30 but you want the wake up time to be 7, don’t feed baby until 7. If baby is not crying, but will happily wait, let him wait. Eventually he’ll just sleep until right around that time that you feed him at daily. It sets you on track for the rest of the day. It helps you determine a good time for the first nap. You will have a bit of time for yourself in the morning. Baby begins to adjust to predictability. Naps… dum dum dum. By now you’re already trying to actually nap when baby naps. That’s a good thing. But the trouble is, you don’t want to wait until baby is screaming in tiredness to put him down. You want to put baby down for nap times that mean he does not *get* overtired. Wearing a baby out to help them sleep is the biggest baby sleep myth around. It will mean the naps are shorter and baby is more fussy. But never fear! The easiest way to make sure your baby is well rested is to have set nap times in the optimal windows. So, let’s talk about those windows. You want to catch the baby drowsy, but not overtired. Here are signs of overtiredness. This means you have consistent times they will go down and, even if they aren’t dropping off to sleep in your arms, you still put them in the crib for a rest. 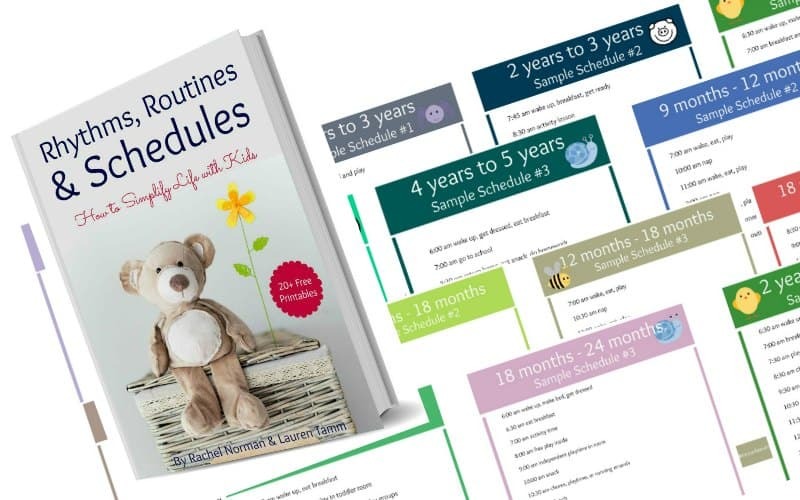 You can find 25+ routines including baby and toddler combinations here. These are simply examples, your routine may vary. The key is to make sure that little babies aren’t up for hours without a nap. That 1-year-olds don’t wake at 5 a.m. and choose not to nap. As mothers we can steer the day by choosing a routine that works for everyone. Screens, loud siblings, busy places, and intense changes of scenery can actually tire a baby out. If your baby is in a room with multiple older children who are screaming, running, and playing for hours on end they will become overstimulated. When a baby’s system is swamped with more noises, sensory experiences, and activity that it can cope with, it may be come fussy, irritable, and have trouble sleeping. With your little ones it’s a good idea to keep the stimulation purposeful and to a minimum. At least until they’re a few months older. When in a place with a lot of activity, noise, and people around hold baby close or wear her in a sling so she can face you and not be bombarded. Instruct older siblings to be gentle with baby and not over play, particularly before nap or bedtime. When creating your baby schedule you want to be sure circumstances are ripe for happiness, not fussiness. This means at nap time you’ll want to let baby sleep in a darkened room, not in a swing in the middle of a brightly lit living room with loud siblings. Why? Because in a few months when baby is older he’ll stop napping well due to the distractions. By that point it’ll be a lot harder to teach baby how to sleep on their own. Also, you’ll need to consider older sibling needs. If you have school runs in the morning or afternoon your baby’s schedule will be dictated by those to a certain extent. Include those first as they are non-negotiables. Try to concentrate errands, appointments, and outings to only a few days a week while you have a new baby. After all, baby is only little for a short while and it’s tough business hauling around a fussy baby all over town. Bedtime is both glorious and hair-raising for moms. Glorious because it’s a special bonding time and, after all kids are in bed, it’s free time! Hair-raising because babies often fight bedtime if we aren’t careful. As with napping and morning wake time, the time you put your baby to bed is extremely important. Babies that go to bed at a reasonable hour sleep better throughout the night. There is an old wives’ tale that I believe rings true. Between 7 to 8 is a great bedtime for little ones. Newborns may go to bed for the night later since they sleep the majority of the day, but all in all, bedtime shouldn’t extend too far past 9:00 p.m. unless you have a good reason. Now, if your partner doesn’t get home until late and you want baby and daddy to have time to play, that’s great! But that just means you’ll need to choose a later wake time if you can help it or be sure baby is getting in sufficient naps throughout the day. Choose a time you know you’ll actually keep, somewhere between 7 and 8:30 is ideal. Begin your wind-down routine around 30 minutes prior to bedtime. In your wind down, be very repetitive and predictable in what you do which will create positive sleep associations. Change baby before you feed then feed in the dark, swaddled, and with white noise on if you use it. Help baby to calm down well. Night feeds can be the bane of a mother’s existence. If you are up hourly all night then it’s true. You actually are losing your mind. But never fear, no melodrama needed… we can get baby sleeping well. Night feeds can be tricky to maneuver, but you can do it. One thing to remember is that babies need a certain amount of milk throughout a 24 hour period to be properly nourished. If this quota gets met mostly during the day, they’ll sleep longer at night. If this quota gets met mostly at night, they’ll wake up all night. This means you want to make sure baby is not falling asleep while eating throughout the day so they are getting full feeds. It also means you want to give them full feeds at each feeding throughout the night to prevent snacking. Let me explain. If baby nurses for 5 minutes then falls back asleep at 11:00 p.m., she will likely wake at 12 or 12:30 and want more. And so on all night. If you keep baby aroused enough to eat for 10 or 15 minutes at 11:00 p.m. baby will likely sleep for a few hours before waking again. Change diaper before feeding so baby gets lulled back to sleep by milk. Attempt to get a full feeding in, not a quick snack. Keep lights down low and avoid any stimulation or play since the aim is for baby to go back to sleep. Attempt feeding baby lying down on the bed. This sensation is similar to lying in their own crib which will make the transition from your bed back to their crib (if they sleep in one) easier and baby is far less likely to wake. But back to the Australia thing…. 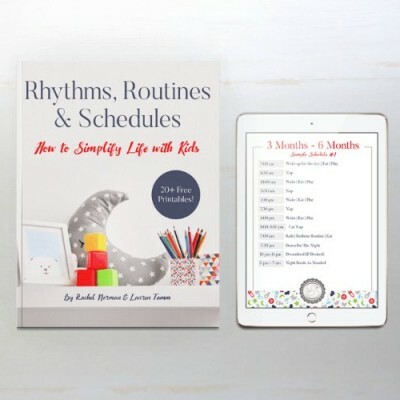 If you want routines and schedules for not only the 9 to 12 month age, but 18 months, 2 years, and on and on I’ve got great news. I’ve created a book chock full of routines that work. Routines that keep babies well rested, happy, and content. Routines that account for all the things you need to do and they are mom tested. The best part? The book comes with printable routines (3 choices for each age) that you can hang up and use! So instead of having to reinvent the wheel every few months, you’ll have tried and true mom tested routines right at your fingertips. 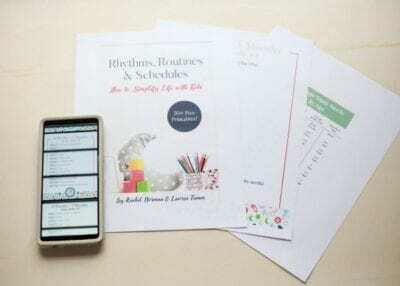 Get your own routine book and printables here! I applied your routine in action with my 2-3-week old, and it worked wonderfully! That is, until at 5-6 weeks old she decided to just lay in her bassinet calmly or with little occasional fuss for up to an hour and a half and throw out the routine, and now, about a week and a half later, she is still sleeping well at night and waking up at the correct time, but catnapping. Have you ever had this happen with your children, and how did you get them back on the schedule? Or are some newborns just like this, they make up their own mind despite our best efforts? I believe I’m doing all the rest fine, swaddling, dark sleeping environment, white noise, right temperature, dummy, wind down routine, putting her down drowsy but awake, not giving overstimulation during awake times and putting to sleep at the sight of early tired signs (which was exactly on your schedule a couple of weeks ago, and she would nod off within 10-15 mins). First off, if baby is well rested then YOU ARE DOING GREAT. First thing that came to mind with me is that perhaps she can stay awakea bit longer before nap? Someties when I put mine down they stare off into space and have a passive awake time as they transition into sleeping. This is quite normal. As a mom-to-be I love reading your blog, trying to get kind of prepared 😉! But I was just wondering how do you handle going for a walk with your baby and how does this fit to your routine? Moreover, when is the best time for it? And do you put the baby in the stroller when he is drowsy or already asleep? We usually walked after a feed and if baby fell asleep in a nap or so that’s okay! Rachel, I love your blog. You insights make so much sense. We are going on a long trip that involves a few time changes. My baby will be 10-13 months old. Do you have any material on traveling with babies? Particularly sleeping routine. Thank you! Rachel, your blog has given me hope. My 3 month old son is a high energy easily overstimulated baby who does not sleep well. I’ve purchased your course and have created a schedule I’ve attempted today. I have a few questions that I couldn’t find anywhere in your blog. 1) when you side lie to nurse do you pick baby up to burp him after feeding or do you put him directly back into crib after? 2) If baby wakes from short 20-40 min nap should I try to get baby back to sleep? I’ve been able to before but I’m afraid I’m creating a crutch so he won’t go back to sleep on his own. If I don’t get him back to sleep do I just count that as wake time and proceed with nursing and activity? 3) Sometimes when I put my son down drowsy but awake he’ll stare at me and instantly start crying. If I leave him he cries harder and it takes me forever to soothe him again. So if he wakes up and fusses how do I get him to go to sleep? Rachel… love the blog! New mom here! My baby girl is 6w today and we’re in desperate need of help. Where did you put your babies to nap and sleep at this age? And should I swaddle my baby for both naps and bedtime? If so, doesn’t that means she’ll basically live in her swaddle at this age?